The great soup of life known as the ocean continues to surprise us with all its mysteries that we gradually uncover. I am continually amazed by life's tenacity, surviving in any way it can. Life indeed knows no bounds, including those of the neat, linear organization we try to impose on it. Interspecies and intergeneric hybrids, fused colonies and chimeras are par for the course. Life doesn't care about species distinctions or about the distinction between separate animals, to a point. What keeps your Acropora from growing into and fusing with your Montipora? It's called self / non-self recognition. Corals, as well as many invertebrates and vertebrates, have the ability to distinguish between their own tissue and that of another species or another animal of the same species. If there were no such recognition, everything would grow and fuse with everything else. This recognition allows the animal to retain its distinction as a separate animal in its surroundings. It is, in short, an immune system. There are three types of fusion among corals: 1) Isogeneic fusion, which is the fusion of coral with genetically identical tissue, such as branches of Acropora fusing into each other, 2) Allogeneic fusion, which is the fusion of genetically different corals of the same species, and 3) Xenogeneic fusion, which is the fusion of entirely different species or genera; this may lead to the formation of a chimera. 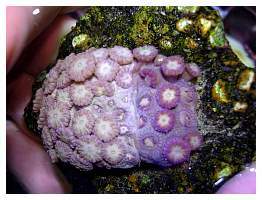 Looking at the pictured Trachyphyllia open brain (left) in the aquarium, I asked myself, "How did this happen?" 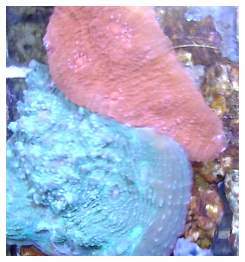 It looked as if someone took two completely different colored corals and seamlessly glued them together. Later, I learned how corals can fuse with other fertilized eggs just after fertilization (Veron, 2000), and this may begin to explain the perfect half-and-half situation of the above pictured open brain. Another type of fusion occurs when two or more coral planulae settle near each other, eventually growing into one another and fusing to form a larger colony, often resulting in a coral with clear distinctions where the original colonies fused. As they grow, or if more than two colonies fuse, the distinctions can be blurred; often, though, it's difficult to distinguish where one ends and the next begins. It has been shown that Pocillopora damicornis larvae will readily fuse with other larvae of another variety of Pocillopora damicornis (Hidaka, 1985). This is perhaps that same thing happening with the Trachyphyllia. 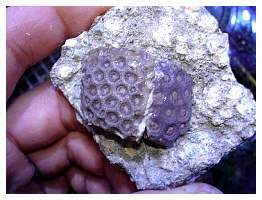 Another example of this phenomenon can be seen in a colony of Goniopora I recently received (photo above). It too was split half-and-half with one side being a purplish-brown color and the other side green. 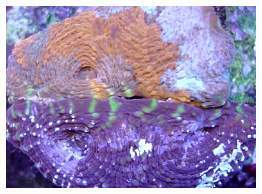 Upon closer inspection of the boundary between the corals (photo below), I could see that some of the individual polyps contained both of the colors, and the corallite walls were seamless between the two halves. 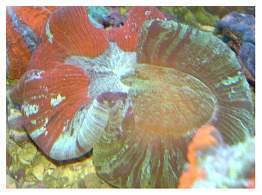 Corals of the same species often fuse their tissue and grow into one larger colony. Sometimes two closely-related corals grow right next to each other and meet up. They remain separated, however, but because they are so closely related they do not kill each other. 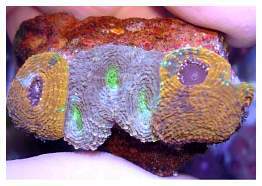 Often zoanthids are available with many color morphs, possibly representing different genotypes, existing side-by-side on the same rock. When examined closely, the different kinds do not actually fuse but live side-by-side. 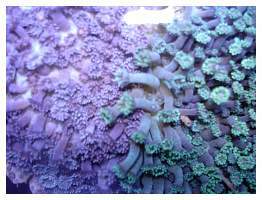 While there is probably competition between the several varieties, they don't destroy each other like a Euphyllia would do to a Montipora. I find this delicate dance between corals exquisitely beautiful. We all love pictures of corals in the wild, with dozens of different species packed together in ways most aquarists wouldn't dare attempt with their prized subjects. 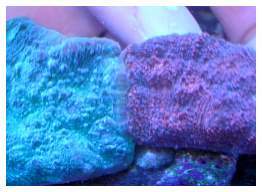 Coral combos are big sellers; the most commonly available are zoanthid combo rocks. It seems an almost infinite variety of colors can be found together on one rock. For me, the creation of these combos is an art. The correct balance of hue, texture, the overall composition and how it draws the eye around the whole piece is what really makes a particular piece beautiful. I am easily bored, though. I was more excited by the Goniopora and Trachyphyllia fusion than by any other combination I've seen in a long while. So, I did what any reef farmer "artist" would do. I grabbed my Dremel! I was so intrigued by these natural fusions that I wanted to give it a try myself. It's generally known that grafting different plants together is nothing new. Go buy almost any rosebush; it will have the root system of a hardy wild-type rose and the top consisting of a beautiful variety. This is often done because the new cultivated varieties don't have roots as strong and fast growing as those of the wild type. You can buy fruit trees with four different kinds of fruit, or flowering trees, half-pink, half-white. So, grafting corals? What!? Why!?! Well, why not? If chosen carefully, the problem of one coral irritating the other will not occur. I decided to start this fusion adventure by experimenting with the genus Acanthastrea. I chose two varieties of Acanthastrea echinata, both of a similar form. One consisted of basic browns with a bit of green scattered about here and there. The other was bright orange with blue streaks. I cut a fragment of both, each having about four mouths. I made sure the sides where the potential fusion would take place were as flat as possible. I then glued both to a plug so that the flat sides were touching each other. After the first week I was relieved to see that they had indeed not killed one another. I then tried the same procedure with two corals in the family Fungiidae. I did not identify them down to the species or genus level, but just noted that one was orange, the other green. I cut each in half with a Dremel and used small amounts of super glue gel toward the bottom of the fragments' wounds. After two days I noticed that the green was dying at the meeting of the coral, and the orange was unaffected. I then separated the corals. There are many species of plate corals in several genera, and this mix was apparently not a compatible one. A closer inspection, in order to graft the same or closely-related species, seemed to be necessary. All of my subsequent graftings were successful in that no more corals were found to be incompatible. I had more Acanthastrea lordhowensis at my disposal than just about any other single species, and thought how pretty it would be to see all those colors together. The drab purplish-brown colony looked quite lovely when contrasted with blue, green and red. For one grafting I cut two polyps in half and then glued them together. They ended up forming their own mouths and not immediately fusing together as I had originally hoped. Also, with many Echinophyllia at my disposal, I grafted several varieties together. The Christmas season was screaming for some red and green fusion, and I was happy to oblige. I decided to apply these methods to some of the Goniopora in my care. I grafted together several varieties of Goniopora tenuidens to one another (allografts). I then tried my hand with green and red Goniopora burgosi and Goniopora stutchburyi. I also did one interspecies grafting (xenograft) between Goniopora norfolkensis and Goniopora planulata. At the time of this writing these graftings have not fused. No direct competition such as stinging is obvious between the graftings, but it's possible they may be involved in unseen chemical warfare. A careful study of grafted and non-grafted specimens will need to be carried out to determine if this is the case. My results echo findings from several scientists. These include grafting experiments on gorgonians in the wild (Bigger, Runyan 1979), Acropora and Porites (Hildemann, Linthicum, and Vann, 1975) and more recent experiments with Seriatopora (Nozawa, Loya 2005.) Isografts often formed quickly and fusion was fast. It was found that allografts did not form stable, long-term fusion between the colonies. There eventually was tissue separation, if it even took in the first place. Xenografts usually resulted in no fusion or one coral dominating the other and/or a large area of dead tissue between the colonies. At the start of this series of grafting I was expecting full fusion from allografts (grafting genetically distinct corals of the same species.) However, after noticing the results of my graftings and reading a large stack of papers on the subject (thanks, Eric), it seems this coexistence but lack of fusion is the best that one can expect among allografts in the adult stage. However, I plan to try more grafting in the future to determine if colony size plays a role. 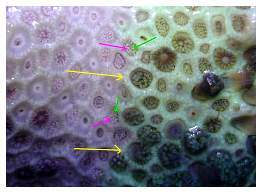 Juvenile corals have been shown to more readily accept allografts and xenografts (grafting of separate species or genera) (Hidaka, 1985; Nozawa, Loya, 2005). I will use very small tissue samples to see if I can get the same reaction as seen in larval and juvenile corals. It should be noted that in these experiments the corals did not form stable chimeras and separated as they matured and their alloimmune system kicked in. In one series of experiments published in the paper, "Transplantation and Immunoincompatibility Reactions Among Reef-Building Corals" (Hildemann, Linthicum, and Vann, 1975), much work was done with Acropora formosa and Porites andrewsii. They found that intracolony isografts consistently formed strong compatible fusions. However, they found allografts and xenografts did not form long-term fusion of soft tissue. In allografts there was initially some soft tissue fusion where they were forced together in the first few weeks, but they then separated their soft tissue with their hard tissue remaining fused. When there was not forced contact, there was none of this initial fusion. In xenografts there was no soft tissue fusion and the corals secreted a layer of skeleton to separate the soft tissues. It was noted that this cementum, as it is called, is quite similar to the cementum corals use to anchor to a substrate. While there have not been any long-term, stable allografts produced by grafting, the previous examples of the half-and-half Trachyphyillia and Goniopora lead me to believe it is possible. The aquaculture of coral is in its infancy. 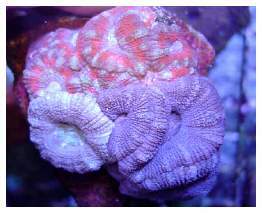 Many techniques can be applied to coral that have already been used for a long time in horticulture. The ocean has shown us that these possibilities do exist. Bigger C.H. and Runyan R. 1979. An In Situ Demonstration Of Self-Recognition In Gorgonians. Developmental and Comparative Immunology, Vol. 3. pp. 591_597. Bigger C.H. 1988. Historecognition and Immunocompetence in Selected Marine Invertebrates. (Richard K. Grosberg, ed.). pp. 55-65. Coombe D.R., Ey P.L., Jenkin C.R. 1984. Self/Non-Self Recognition In Invertebrates. The Quarterly Review of Biology, Vol. 59. Hidaka, M. 1985. Tissue compatibility between colonies and between newly settled larvae of Pocillopora damicornis. Coral Reefs. 4:111-116. Hildemann, W.H., Linthicum, D.S., and, D.C. Vann, D.C. 1975. 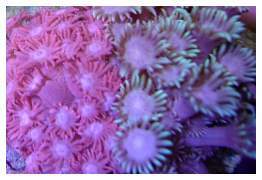 Immunoincompatibility Reactions In Corals. Adv Exp Med Biol. 64:105-14. Hildemann W.H., Linthicum D.S., and Vann D.C. 1975. 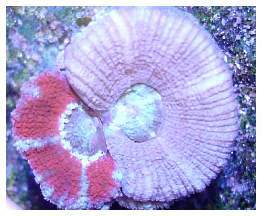 Transplantation and Immunoincompatibility Reactions Among Reef-Building Corals. Immunogenetics 2:269-284. Rinkevich B., Frank U., Bak, R.P.M., Muller W.E.G. 1994 Alloimmune Responses Between Acropora hemprichi Conspecifics:Nontransitive Patterns of Overgrowth and Delayed Cytotoxicity. Marine Biology. 118, 731-737.